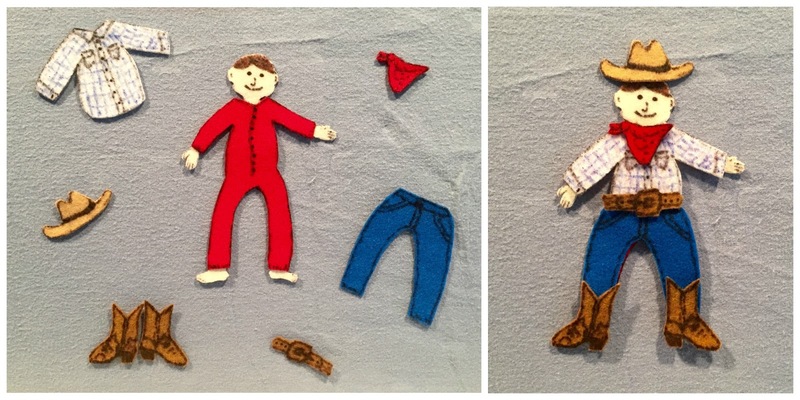 Adventures In Storytime (and Beyond): Round 'Em Up, Pardner! It's Cowboy/Cowgirl Storytime! Round 'Em Up, Pardner! It's Cowboy/Cowgirl Storytime! My manager had asked me to develop a kit for our Storytime-To-Go program with a "Cowboy/Cowgirl" theme when I first started this job a few months ago. The book selection took much longer and was more challenging than I expected. I think I looked at every book in our system and at my local library about cowboys, horses, coyotes, and the old west. There are a number of good books, but most of them are just too long for preschoolers. But I finally came up with 10 I was happy with, and worked on the extension activities to go with it while I waited for the books to be ordered, received, and processed. I finally was able to work it into the schedule and try it out this month! We started each session off with an introduction, letter-of-the-day (Cc), and then our "story song" to help us settle. Let's Sing A Lullaby With The Brave Cowboy was the clear winner; let's face it, you can't go wrong with Jan Thomas. The kids loved the silly cowboy who turned out not to be so brave after all. I found the tune to the lullaby on the author's site. I sang it straight, but one of my volunteers had the kids practically rolling on the floor laughing with her slightly off-key, very cowboy-twangy rendition. They loved it! Are You A Horse? by Andy Rash was a close second. You can make it interactive by letting the kids guess what the present might be and name each creature Roy comes across on his quest to find a horse. Don't be surprised if it takes longer than you'd think for the kids to notice the last picture and realize that Roy still didn't quite know what he was doing. It's a little long, so if we are short on time or it's a younger group, I skip the pages about the chameleon and/or sloth. Simon Puttock and Caroline Jayne Church's Little Lost Cowboy was another favorite. The kids empathized with Cowboy Coyote being lost and lonesome and having one mishap after another. And of course they love joining him in howling at the moon. I use this opportunity to illustrate that the best thing to do if you find yourself separated from your grownup is to stay right where you are and yell until they find you, rather than wandering around and getting more lost. I was glad to find Giddy Up, Cowgirl by Jarrett J. Krosoczka in order to have some cowgirl stories, too. This story had a little cowgirl trying to be helpful, but not always getting things right. It has several cowboy phrases the kids can repeat. Another great find was I Want To Be A Cowgirl by Jeanne Willis and Tony Ross. The main character is a little girl who lives in the big city yet spurns girly activities and instead dreams of being a cowgirl out on the open range. I found it empowering, by rejecting feminine stereotypes and saying girls can be whatever they want. Clip-Clop by Nicola Smee is another great, all-purpose kind of book that is short and simple enough for younger kids, but fun enough for older kids. I've used it in farm and horse storytimes as well. The kids can name animals and make the "clip-clop" sounds along with the story, getting faster and faster. A Wild Cowboy by Dana Kessimakis Smith and Laura Freeman is a cute story about a little boy pretending to be a cowboy as he goes to spend the evening with his grandmother while his parents go out. It is also a great book for adding some needed diversity to this theme, as it features a multi-racial family, with an African-American father and Aisan mother. Noni the Pony by Alison Lester is a cute little story about a sweet pony and her friends. It shows them playing games, telling stories, and snuggling together at night to keep Noni from being scared of the strange sounds in the night. A good choice for the younger groups. The Cowboy ABC by Chris Demarest was the only book I could find about real cowboys that was suitable for this age group. The kids were interested at first, but got a little restless by the end, so either be prepared for that, or you might want to just show selected pages rather than read the entire book. Cowboy Baby by Sue Heap was the only book I ordered without ever having a chance to review a copy first, and it wasn't quite what I had expected. I thought it would have much less text and be geared for younger kids just based on the title and cover. It is a decent book, but because of the amount of text, I'd be leary of using it with younger kids. It's about a toddler pretending to be a cowboy as he gets ready for bed and rounds up all his "pardners". One of the most fun activities was also one of the most simple, with a song that allowed the kids to pretend to be riding horses while seated. While patting their hands on their thighs in rhythm to imitate the sound of horse hooves, we sang this easy song to the tune from "The William Tell Overture" (also known as "The Lone Ranger Song"). Repeat as many times as you like, getting faster each time. Don't fall off! Another fun song let us imitate different animals out on the prairie. I also had a couple of flannel board activities. The first uses rhyming verses to help give the kids a clue as to what the cowboy needs to put on next to get dressed for work, and the second lets them count up from 1 to 5 and back down with coyotes. "The Cowboy Dresses Himself With Care"
A cowboy dresses himself with care. He starts with long, red _____ (UNDERWEAR). So the cowboy wears a strong plaid _____ (SHIRT). To protect his legs, he wears sturdy blue _____ (JEANS). The cowboy bent, and ran, and knelt. To keep his pants up, he wore a leather _____ (BELT). The coyote howls; the old owl hoots. On his feet, the cowboy wears leather _____ (BOOTS). So around his neck he wears a soft _____ (BANDANA). A cowboy is a cowboy, and that is that! On top of his head, he wears a ten-gallon _____ (HAT). And now our cowboy can't be beat! One little coyote, howling at the moon. Along came a friend and joined his tune. Five little coyotes, watch an owl soar. One ran after it, and then there were four. Four little coyotes sniffing at a tree. Once chased a mouse, and then there were three. Three little coyotes where the clover grew. One chased a rabbit, and then there were two. Two little coyotes sitting in the sun. One went for a drink, and then there was one. He went to sleep, 'cause the sun would be up soon. We had a lot of fun with this theme (and as you can see, I got in touch with my inner cowgirl), despite some concern from a couple of the volunteers about how well kids would relate to it these days. But, thanks to "Toy Story" most kids are at least somewhat familiar with cowboys and cowgirls and seemed excited about the theme. I think most were surprised to learn that cowboys are real and still around today, and we did try to talk a little bit about where cowboys live and work and what they really do. I also asked if girls could be cowboys, too, and they all said "Yes!" without any hesitation. 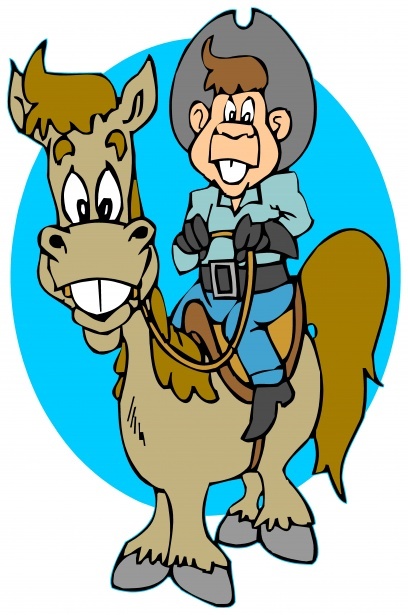 Kids don't get hung up on semantics like adults do, though I did use both "cowboy" and "cowgirl" terms. As I mentioned above, the kids absolutely loved the way one of my volunteers sang the lullaby from Let's Sing a Lullaby with the Brave Cowboy, in heavy cowboy twang and slightly off-key. They died laughing and asked her to sing it again after the story was over, and joined in with her. It was great! Several kids commented on how the cowboy really wasn't very brave, after all. One little girl piped up at the part where the cowboy asked if wolves like lullabies and said, "No, they like pigs!" They also really liked Are You A Horse?, but most agreed Roy still had A LOT to learn about being a cowboy! Clip-Clop is always fun, too, and was particularly good for the younger groups. Another cute comment.....while reading I Want To Be A Cowgirl, every time I read the line "I just want to be a cowgirl, Daddy. Now, what's so wrong with that? ", one little girl would say "Nothing, nothing's wrong with that." The other songs and activities went well, but they LOVED the "Giddy-Up" song, going faster and faster. The song was so simple they joined in right away, and I think most seemed to be at least somewhat familiar with the tune. As we went faster and faster, I would warn them to hold on tight and don't fall off, then at the end I would ask if anyone fell. First they'd say "No", then some would change their story. One little boy said he fell off into a cactus, ouch! I also observed with "A Cowboy Gets Dressed With Care" that the kids had trouble with rhyming words. Many didn't really have a concept of what rhyming words are, and the ones that did, and could name rhyming pairs, still had trouble applying it in the context of the activity, so we will have to work on that some more. I do wish I had been able to find a few more books that were really interactive, and I really could've used two or three shorter books as well. If anybody has any suggestions, please leave them in the comments! Oh, I almost forgot, one of the classes at the preschool we just started visiting in February paid me a huge complement. The teacher mentioned that they had adopted "my" story song, and now use it every time they have reading time, and that the kids like it and it really helps them settle down. Imitation is the sincerest form of flattery, after all.